This one tints quite nicely. I wasn't sure how it would perform when I first saw the get consistency. Very natural and pretty! Happy Holidays to you and your family, dear! 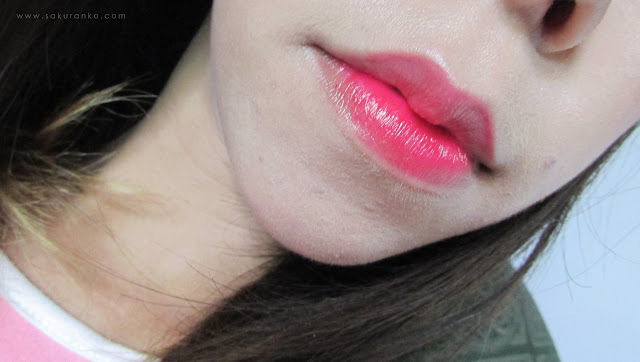 Although the colour isn't long lasting, it does look really beautiful and glossy on your lips! Me gustó el efecto natural que dejó en tus labios, no he tenido oportunidad de probar los productos de Etude, pero siempre veo buenos comentarios sobre ellos, que pases Felices Fiestas! Even though the formula is watery! I am surprise that the color is so pigmented! Se nota que es un buen producto. Happy New Year, to you and yours, dear Sakuranko! This shade looks nice on you! I've heard people say a positive things about the longevity so I was a bit surprised you said it isn't long lasting enough but it all depends on the person anyway. Nice review!